Phytophthora blight, caused by the oomycete Phytophthora capsici, causes a root, crown and fruit rot of cucurbits, tomato, pepper, and eggplant. Phytophthora blight was first reported on peppers in 1922 and on cucurbits in the 1930s, and infections occurred sporadically until the 1980s, when disease incidence started rapidly increasing. It is now one of the most devastating diseases of solanaceous and cucurbit crops, most notably of winter squash and peppers, and can cause total crop loss. P. capsici can cause root, crown, and fruit rot in pepper, tomato, eggplant, and all cucurbits. In tomato, P. capsici is one of the pathogens that can cause buckeye rot of tomato fruit. In cucurbits, root and crown rot caused by P. capsici appears suddenly as a permanent wilt due to root infection following rain or irrigation. Roots and stems near the soil line will appear water-soaked, dark brown in color, and will become soft. Whole plants or vines collapse quickly. In peppers, P. capsici causes distinctive black lesions to form on stems. Infected stems remain rigid but foliage and fruit wilt and wither, and remain attached to the plant. Cucurbit and tomato fruit can become infected at any stage of maturity, either from direct contact with the soil or from splashing rain or irrigation. Initially, symptoms will appear as small water-soaked areas that quickly enlarge and can become covered in sporangia in high humidity. Sporangia-covered lesions will have a yeast-like, gray to white appearance. The rot will develop rapidly until the fruit is completely collapsed. Disease will develop particularly rapidly following harvest. Pepper fruit may develop similar lesions, but more commonly becomes infected systemically, through the plant roots and rots on the plant as described above. Pepper leaves may also be infected by zoospores dispersed by splashing water, and will develop lesions similar to those on fruit. Phytophthora blight is a polycyclic disease, meaning that under favorable conditions, the pathogen will re-infect crops several times throughout the growing season. P. capsici has two mating types (called A1 and A2) that are morphologically identical but genetically distinct. When both mating types are present in one field, they mate to produce survival structures called oospores. Oospores can survive in the soil for many years and provide the initial inoculum for disease initiation in the spring when conditions become favorable. The asexual stage of P. capsici, which is responsible for initiating infection, depends on water for infecting and moving between plants. Disease will almost always begin in low spots of fields or in areas that do not drain readily. When contaminated soils are saturated for several hours and temperatures are relatively warm, P. capsici will form structures called sporangia, which contain asexual, swimming zoospores that are released into the saturated soil. Zoospores are attracted to living plant parts in the soil and on the soil surface and swim toward them. Once they find a host plant, zoospores can germinate and infect any plant part either in the soil (roots, crowns) or via splashing water (leaves, fruit). Oospores are spread from field to field in infested soil adhering to machinery or humans. Zoospores are spread primarily through water—splashing water from irrigation or rain, or water running through fields during irrigation or rain events. If contaminated field runoff or water used to wash contaminated equipment drains into an irrigation pond, that irrigation pond may become a source of inoculum and spread the pathogen throughout the crop or onto other fields. Researchers in Michigan have shown that P. capsici can move in river water, although a 2013-2014 UMass survey in the Connecticut River Valley did not find the pathogen in the Connecticut River. Yield is reduced when whole sections of plants collapse due to disease, fruit is infected in the field, or infected fruit is harvested and disease develops in transport or storage. 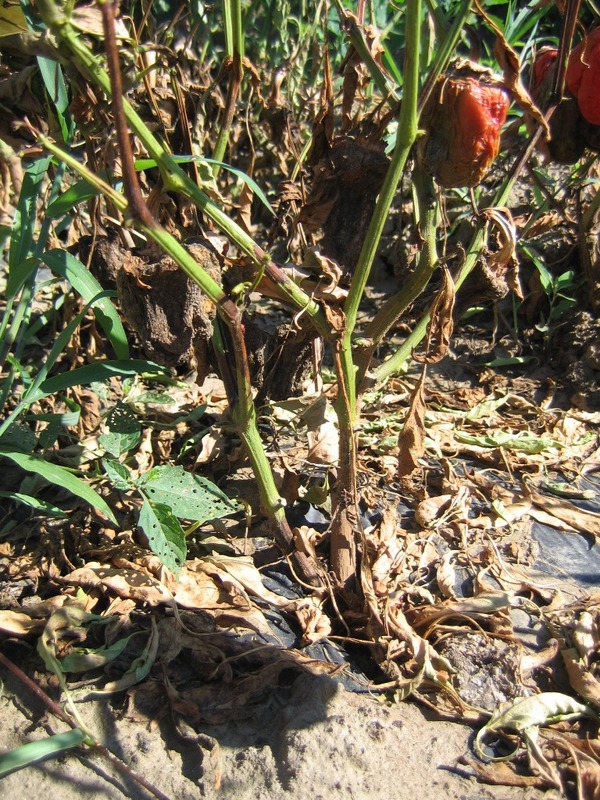 Complete loss of the crop can occur when infection is severe. Whether you are in an infested or uninfested field, the critical goal is to manage water so that there is never standing water for longer than 24 hours anywhere in the field. If you must grow crops in a field with a past history of Phytophthora blight, there are some management practices that will help reduce disease. Extended periods of rain are very likely to result in significant disease development if the pathogen is present no matter what you do, but the practices outlined below may help your crops survive under moderate conditions. Keep records of contaminated fields. Do not rent land for susceptible crops without investigating the history of disease problems. Separate susceptible crops (if possible) such that there is no opportunity for water to move from one planting to another. 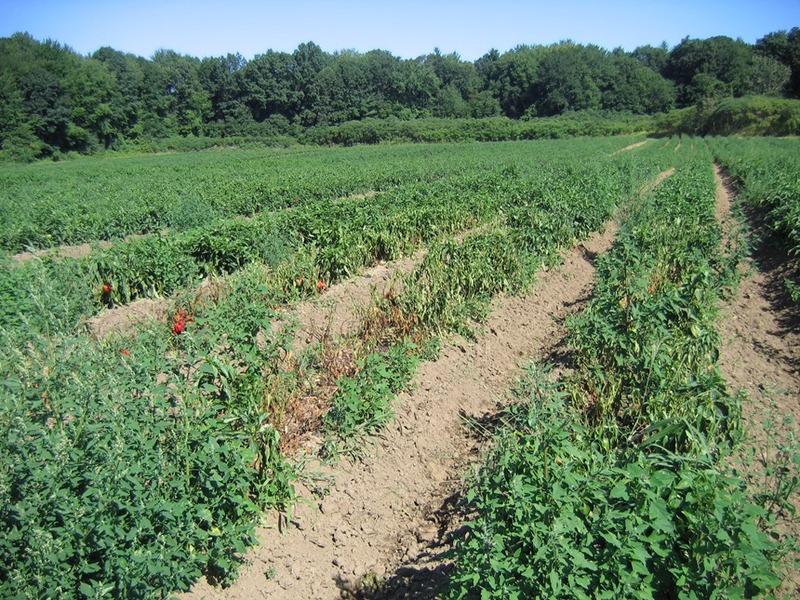 Avoid introducing Phytophthora into uninfested fields. After working in Phytophthora-infested soil, wash soil from equipment. Always work in clean fields before working in infested fields. Rotation: No effective rotation period has been established, although University researchers currently recommend a rotation away from susceptible crops for at least three years. Two years has proven to be ineffective. Resistant Varieties: Plant resistant varieties whenever possible. 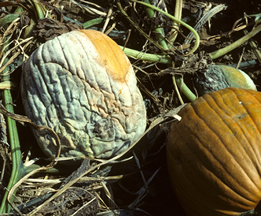 Pumpkins with hard, gourd-like rinds are less susceptible to Phytophthora fruit blight. ‘Lil' Ironsides’, ‘Apprentice‘, IronMan’, ‘Rockafellow’, and ‘CannonBall’ have been reported as moderately resistant. ‘IronMan’, ‘CannonBall’, and ‘Rockafellow’ also possess powdery mildew resistance. Bell peppers that are relatively more resistant include ‘Conquest’, ‘Paladin’, and ‘Emerald Isle’. Water management: Phytophthora requires saturated soils for infection. Use the following methods to encourage drainage and avoid prolongued soil saturation. Be careful to not overwater. Check irrigation system regularly for leaks and fix them. Break up hardpan and encourage drainage by using a V-ripper or other sub-soiling tool between rows, or deep vertical tillage equipment in-row. Do this pre-planting and as needed during the season. Avoid soil compaction. Use farm machinery as little as possible throughout the season and never work in fields when the soil is wet. Plant non-vining cucurbit crops (i.e. summer squash) and peppers in dome-shaped raised beds of at least 9 inches height. Use a transplanter that does not leave a depression around the base of the plant. Make sure water can flow out of the field. Create breaks in raised beds and clear away soil at the ends of rows to prevent damming. Mulch between rows and on bare soil with straw or leave cover crop stubble to reduce splash dispersal of inoculum. Inoculum can move rapidly across black polyethylene mulch and bare soil. Practice good sanitation and do not discard cull fruit in the field. Combining no-till cover crop production with moderately resistant varieties can reduce fungicide inputs, resulting in reduced production costs and delay the development of fungicide resistance in pathogen populations. When symptoms are localized in a small area, disking the area may be worthwhile. Phytophthora blight cannot be managed by fungicide applications alone; successful disease control in infested fields is achieved only by a season-long effort to manage water and utilize other cultural practices. Fungicide programs for managing Phytophthora blight must be preventive and require multiple applications throughout the season. 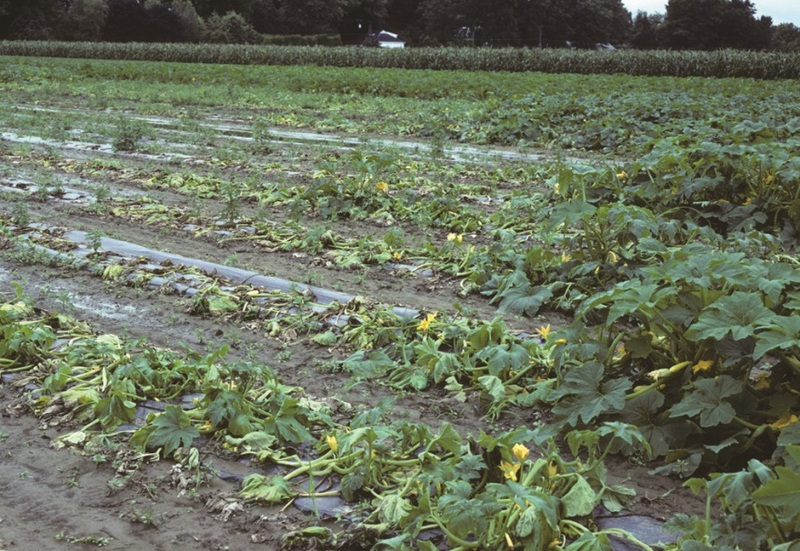 Many New England growers may decide the cost of materials and spraying is not economical, especially in winter squash production. Fungicides may be easier to apply and more effective in pepper fields where drip irrigation line is used in conjunction with raised, plastic-mulched beds. While mefenoxam/mancozeb (e.g. Ridomil, Apron) has been recommended for years, over-dependence on these materials has led to resistance within some field populations. Other broad spectrum materials to consider would be: copper compounds (e.g. Kocide, Basic Copper 53, Champ 2F); the phosphorous acid fungicides (e.g. Prophyt, K-phite, Agri-fos), which can be used as drench treatments at plant and as follow-up applications to foliage; biofungicides such as Bacillus spp. (e.g. Serenade, Double Nickel, Taegro), Trichoderma spp. (e.g. Root Shield Plus), or Streptomyces spp. (Actinovate, Mycostop), which can be used as broad-spectrum protectants applied at plant and as follow-up applications through drip-lines or to foliage, though their efficacy is generally lower than conventional pesticides. In addition to broad spectrum protectant fungicides, many targeted materials are labeled, but in order to be effective they must be used preventively and in a rotational program to manage resistance development. In cucurbits these include Presidio (FRAC 43), Ranman (FRAC 21), Zing! And Gavel (FRAC 22), Zampro and Revus (FRAC 40), Curzate or Tanos which may have some curative effect (FRAC 27). For pepper, in addition to those materials previously listed, the following could be used: Omega 500 (FRAC 29), and Reason 500 (FRAC 11), which is labeled for suppression only. For the most up-to-date information on chemical controls please consult the New England Vegetable Management Guide and always follow label instructions carefully.